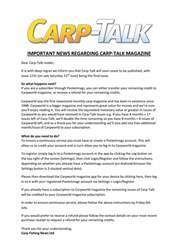 This week’s issue of Carp-Talk (issue 1045) is available to download now. 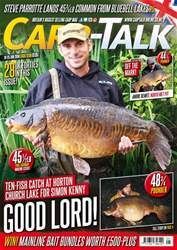 It features the full story on the largest brace of carp ever caught from the UK, when Stafford carper Juan Coetzee recorded mirrors of 59lb 15oz and 54lb from Ringstead Carp Fishery. 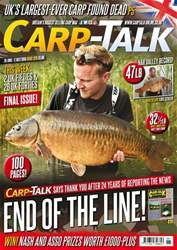 We’ve also got the lowdown on the new Yorkshire record carp of 58lb, banked from the Erics Willows Lake near Castleford, West Yorkshire, by Alan Firth. On the features side, Simon Crow has been out on the day ticket trail while filming with the Nash boys, Louie Russell records his annual trip to Richworth Linear Fisheries, while Steve Briggs details a trip to a new Dutch venue due to open to English carpers very soon. There’re also great giveaways including the Mainline Fox Carp Angler of the Year competition, £240 worth of Taska prizes, as well as ten new Keith Jenkins books up for grabs as he launches his new title The Messenger.